$20 worth of Revlon for only $2!! 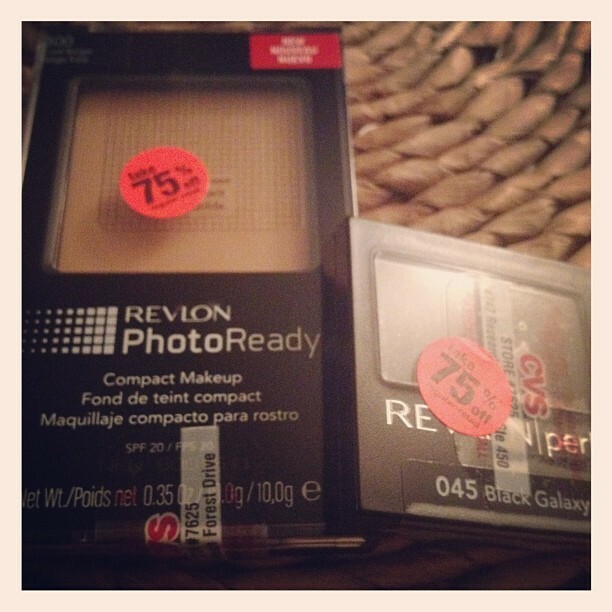 This weekend, I was able to get a Revlon Photo Ready Compact and eye shadow for only $2 total!These retail $13.99 and $5.99 respectively. Last week, CVS mailed me a coupon for $3 off any Revlon. Before heading to Kroger, I stopped in to see if I'd luck up on any of the brand in clearance. There was none on the clearance rack, so I headed over to the cosmetics aisle. Luckily, I found a few items with the 75% sticker. The compact was discounted to $3.49 making it only $.49 after my CVS coupon. The eye shadow was only $1.49, so I couldn't pass it up. Even without a coupon, this was a great find. A ton of other coupons printed for me at the CVS coupon machine, so I will be heading back to CVS soon!